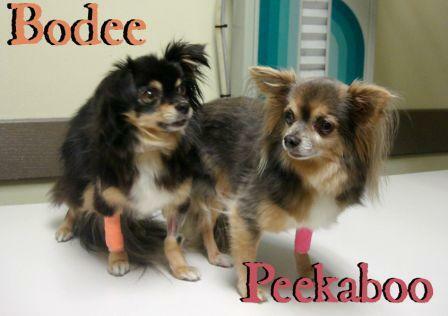 Bodee’s and Peekaboo’s mom brought the duo all the way from out-of-state to receive dental care at Winslow Animal Hospital. The sterling reputation of Dr. Amy Hinze drew the attention of a Pet-Parent who knew her girls deserved the best, and it would be worth a few hours in the car! Bodee is a little more reserved and has a shaved spot on her head where a lump was removed. Peekaboo is more excitable and wants to keep moving. They’re a sweet pair, and super cute, too!